can improve your quality of life. You'll be able to swim whenever you like, on your schedule, at your speed. No more travelling to the local leisure centre. Just your own compact swimming pool, where you swim or exercise against a broad, deep current that's adjustable to any speed, stroke or ability. The small footprint means our swimming pools use fewer resources and energy than traditional pools. It's the perfect pool for the British climate. 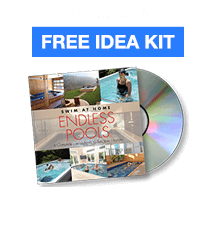 Request a Free Idea Kit and see for yourself how an Endless Pool can improve your quality of life.